For our latest tasting session, we decided to look at beers a little closer to home. A little? After trying several American Microbreweries’ beers, we’re now drinking beer from Haarlem. Our HOME TOWN! So, let’s state the obvious and get all doubts out of the way before we start: we’re going to LOVE this beer. We’ve already been drinking it for quite some time, but not all varieties. Hence the tasting session. We’ll get back to that in a minute. Haarlem was once a city with many breweries. Place names such as Brouwersvaart (Brewers’ Canal) Brouwerskade (Brewers’ Quay) and Brouwershofje (Brewers’ Yard) remind us of this rich history. Beer brewing was by 1400 the most important commercial activity of the city. By the late Middle Ages, beer from Haarlem was exported all over the world, indeed even used as a form of currency in the southern province of Oost Zeeland. It was shipped by the Dutch East India Company to the Orient, and was well known in Flanders (Belgium) and Northern France. In 1994, inspired by all this history and the loss of all the historic breweries, a group of enthusiastic Haarlemmers took up the challenge of putting Haarlem back on the world beer map. That year, after centuries of absence, Haarlems Jopenbier was brought back onto the market. This happily coincided with that year’s celebrations of the city’s 750th anniversary, bringing a taste of the past with Hoppenbier’s recipe, which dates from the year 1501. 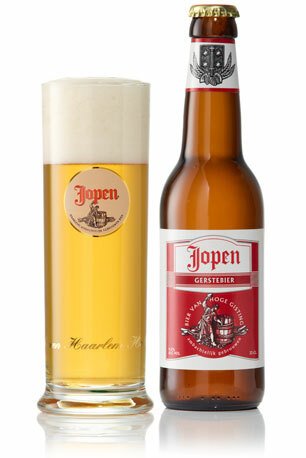 The success of Jopen (Named after an ancient brewing vessel of 112 litres), was followed by the launch of Jopen KOYT, a beer in which the mediaeval recipe demanded the use of herbs for flavouring rather than hops. In 1999, Jopen ADRIAAN was introduced, a light varient of another herbal beer from 1407. Encouraged by the success of these beers, the Haarlem brewers brought a unique Bokbier (Traditional Dutch Autumn beer) onto the market. This is brewed from four different grains (Malted barley, wheat, oats, rye), smooth tasting rather than sweet. 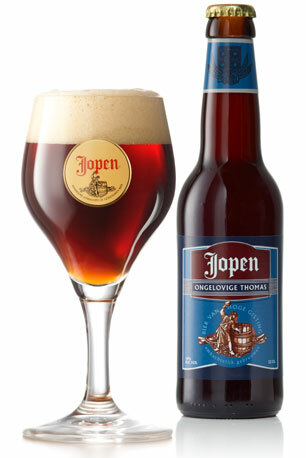 Jopen Bokbier is the best selling beer from an independent brewery in The Netherlands. Since 2003, there is also a Jopen LENTEBIER (Spring beer) available, which is distinguished by the liberal amount of coriander seeds with which it is brewed. So, time for some beer! After a pre-taste in the lovely Jopenkerk, I decided to select 6 different beers from Jopen’s extensive line-up: Jacobus RPA, Malle Babbe, Gerstenbier, Ongelovige Thomas and Trinitas Tripel. This beer was first brewed to commemmorate the 100th anniversary of the church (Jopenkerk is officially called Jacobskerk). Jacobus (James) is the patron saint of pilgrims, recognizable by the scallop shell – also known as St. James’s Shell. In the past, these pilgrims spent the night in guest houses along the route of their journey. Because of these visitors, these guest houses had a special arrangement with the tax authorities: they were exempt from excise duty as long as they brewed with rye. Hence Jopen has chosen to make Jacobus beer a rye beer: a Rye Pale Ale. 5.3% alcohol and a generous handful of hops ensure a spicy, dry and full-flavored hopped quaffer with an amber color. Imagine a light version of an IPA. Our verdict: quality beer, great color, power and taste. 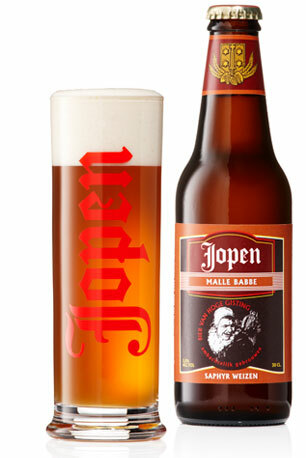 Jopen Malle Babbe is a ‘dunkel weizen’ (dark wheat beer). Just like a regular ‘weizen’ it has a fruity (banana) character with a slightly spicy touch of cloves and bay leaves. Another aspect of this beer is the fact that some dark wheat malts have been used which give it more color, but also a somewhat fuller, slightly caramel-like flavor. The whirlpool addition of Saphir hops gives Jopen Malle Babbe an extra fruity flavor. Saphir is a German hop with a bit of American citrus character. There is some resemblance with the Fokker Beer of 2011, but this is really a very different dunkel weizen. According to some stories Malle Babbe was a Haarlem prostitute in the time of the painter Frans Hals. Frans Hals portrayed her and the painting of Malle Babbe can nowadays be seen in the Berlin Gemäldegalerie. In the Netherlands she gained fame through a song that Lennard Nijgh originally wrote about her. Sung by Rob de Nijs with the music from Boudewijn de Groot, this song became a hit in 1975. Our verdict: initially, we thought this to be a beer for women. And yes, the women loved it, but several men admitted that this beer actually turned out to be their favorite one! Fresh, fruity and juicy! A brew named Jopen Gerstebier (barley beer) has been created especially for the Open Monument Days and the Jopen Festival. This type of beer was brewed by breweries that still existed in the early 1900s, the period of the great breakthrough of Pilsner beer. Brewers had to change their set-up to bottom fermentation in order to brew Pilsner, which was too large of an investment for many of the smaller breweries: to be able to produce bottom-fermented beer they needed an ice cellar or cooling machine. In response to the trend of the Pilsner they started producing a top-fermented beer that was also blonde and bitter in order to be able to offer the audience an alternative. Also in Haarlem, barley beer was brewed by breweries that were still operational in the early 1900s. Jopen Gerstebier is a blonde beer with 4.5% alcohol. Like the Pilsner in those days, the Jopen Gerstebier possesses a considerable bitterness. Its somewhat lower alcohol content (which was also normal in the early 1900s) makes it an easy drinker. Our verdict: a lot more interesting than your regular bottom-fermented Pilsner or Bavarian Beer. Not as boring as the Heinekens and Amstels and looks beautiful in the glass. 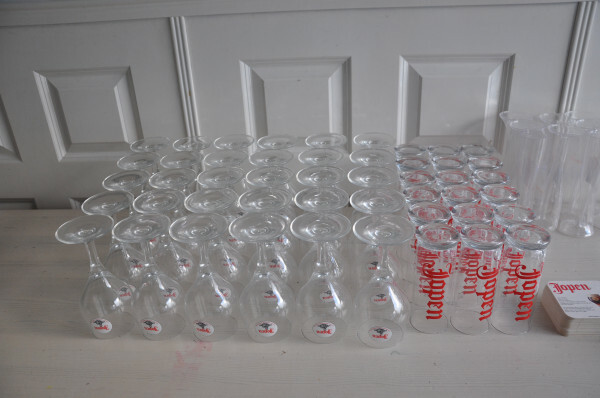 On 11 November 2009, Jopen Beer turned fifteen. To celebrate, they brewed an anniversary beer for the third time: JubelJoop III. Their brewer Chris Wisse chose to brew a strong Tripel with 9% alcohol. The historical Hoppenbier forms the basis for the Tripel (recipe from 1501). That’s why barley malt, wheat malt and oats are used. The wheat malt and oats give the beer a complex, spicy character. The beer is supplemented with a little coriander and a yeast strain that creates lots of fruity flavors. At the BrewNZ Beer 2010 elections, JubelJoop III was awarded silver in the Tripel category. Moreover, the Tripel snagged bronze at the European Beer Star awards. Due to the great success of this Tripel it was decided to permanently add the beer to our catalogue and give it a new name: Jopen Trinitas Tripel. 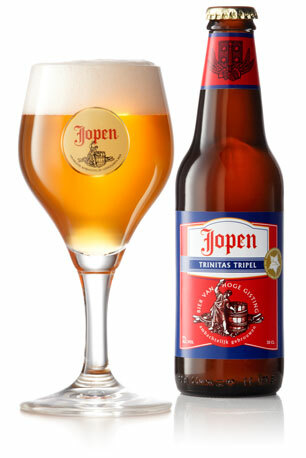 Jopen Trinitas Tripel derives its name from the Holy Trinity: the Father, the Son and the Holy Spirit. In Germany, the so-called Purity Law (Reinheitsgebot) is used: water, malt and hops as the three ‘sacred’ ingredients. Jopen sticks to the Haarlem Brouwerskeur (a municipal recipe from the old days) with our own trinity: barley, oats and wheat. Our verdict: the favorite of many of those who attended the tasting session. Comparable to the best Belgian Tripels, but even more interesting because of its more varied set of flavors. Hats off to this beer! Jopen Ongelovige Thomas (Doubting Thomas) is a beer for the more experienced beer lover. Both with regards to alcohol content and in the dosage of American hops (Simcoe, Cascade and Chinook), this is a strong beer. The generous amounts of American hops ensure a considerable, fruity bitterness, which will certainly surprise true ‘hopheads’. The higher alcohol content creates a warming effect, making this a true beer lovers’ beer. Jopen Ongelovige Thomas is a beer to sip from a tall glass in front of the fireplace, so all of the wonderful smells can be inhaled to the fullest. Our verdict: very good quadruple beer, dark as well as light fruits and spices. Good stuff! Strong though. Don’t start your evening off with this beer if you want to keep going for a long time. 😉 But high grades all over for Ongelovige Thomas. Tags: BierGerstenbierJacobus RPAJopenJopenkerkMalle BabbeOngelovige ThomasTrinitas Tripel.